Facilities Team Green (FTG) is a group of undergraduate student staff who work to make sustainability more accessible for their peers on campus, and for everyone in the University community. Facilities Team Green falls under the umbrella of University Facilities and Services, but works throughout the River Campus and Medical Center to promote sustainability initiatives and increase awareness among the University at large. 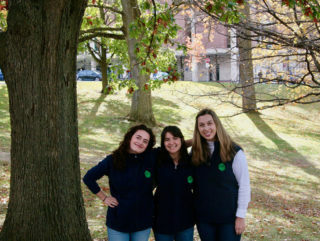 It is a team of three student positions under the management of the University’s sustainability coordinator, Amy Kadrie. As the sustainability coordinator, Amy has been managing, planning, directing, and promoting University Facilities and Services’ sustainability programs for nearly a decade. Amy spearheads three annual events: E-Cycle Day, Shred Fest, and Move-Out Cleanout. These events collect personal items from employees or students and either donate, repurpose, or recycle all of them. Team Green assists in promoting and participating in these events. As the manager of Facilities Team Green, Amy supervises the team to work on projects, engage in social media, and spread awareness for different sustainability campaigns within the University. The team is made up of three positions. The sustainability assistant helps Amy in planning and executing tasks such as RecycleMania, the annual eight-week waste reduction competition that takes place in the early spring. The sustainability marketing intern manages the UR Sustainable Facebook, Instagram, and Twitter accounts and creates promotional material such as flyers. The sustainability writing intern writes biweekly Go Green! articles that are published in the The Green Dandelion blog, the @Rochester employee newsletter, and the Weekly Buzz, and helps to apply for sustainability awards. Additionally, one of these team members also takes on the role of team leader to facilitate meetings among the team and to foster relationships with other groups, such as Dining Team Green and EcoReps. All students on Facilities Team Green table for various events and promotions and contribute Student’s Corner articles and Green Tips to The Green Dandelion blog. Facilities Team Green participates in many different sustainability initiatives each year to promote recycling, reduce waste, and generally encourage sustainable behaviors on campus. The monthly tabling events allows Facilities Team Green to interact with students, staff, and faculty on campus to inform them of current green initiatives and encourage participation in events such as RecycleMania. In addition to RecycleMania in the spring, Facilities Team Green assists in the GameDay Recycling Challenge, an international competition that promotes waste diversion at a home football game each fall. Together, the team uses blogging, social media, events, and word-of-mouth to educate the University of Rochester on current initiatives in sustainability.